Roll up curtains protect you, your staff, and your visitors from harmful UV rays, and also provide the comfort of soothing shade. Are you in the process of looking for or considering ways to better utilize your commercial space so it works just as hard as you, but are not entirely sure where to start? Knowing what products or material will best help you achieve this is not always the easiest. However, one way to do this simply and with minimal fuss for your business is by utilizing roll up curtains. These not only create an elegant and eye-catching enclosure for any commercial outdoor space, but they improve your property’s usability. Having an enclosure that is flexible and can seamlessly keep up with the ever shifting needs of your business is invaluable. Unlike expensive installations which may fall in and out of favor and style, roll up curtains will stand the test of time and provide timeless comfort to your space. When it comes to custom roll up curtains, they are also available in a wide range of colors. You can choose whatever would complement the color scheme, architecture, and other features of your business space. Sun damage can affect both people and objects negatively. It’s harmful UV rays and other components not only bleach furniture over time, but contribute to sunburn, which is highly uncomfortable. Roll up curtains protect you, your staff, and your visitors from harmful UV rays, and also provide the comfort of soothing shade. During hot summer days, it’s important to provide your customers this comfort, so they feel comfortable and refreshed and can spend enough time in your commercial space to purchase your wares or utilize your services. If your business includes an outdoor seating area, roll up curtains will help make that area comfortable and attractive to customers. Separate floor space easily, or even open them up when you require extra space. Use them to secure and delineate public and employee only spaces. Roll up curtains are easy to install, clean, maintain, and replace. 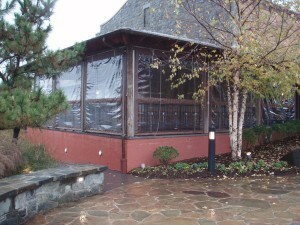 They help keep outdoor spaces cleaner, and allow you to better control temperature, sound, and odor in your business.